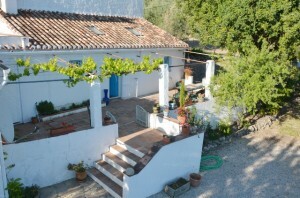 Description This is a lovely rustic country Finca in a very pretty hamlet and backing onto open countryside with wonderful views. The property is located just 5 minutes from the village of Periana with its every amenity, including good primary and secondary schools, and just 55 minutes from Malaga and the airport. The house is set in its own grounds and has just under 3 acres (11,600sq mtrs) of land. The current owners keep 3 horses, with an OCA licence in place for up to 5 horses. The land is part way to becoming certified as organic and provides approx. 200 litres olive oil annually. There is a manège /schooling area and outdoor equine shelter. There is also an orchard area containing many different types of fruit trees. The house comprises 4 bedrooms, a fully fitted kitchen, 2 sitting rooms, a spacious dining area, and 2 downstairs bathrooms. Upstairs there is a roof terrace that is partly covered and has the most beautiful views. The house is arranged in such a way that it can be separated into the main house and a smaller apartment with its own separate entrance (including a second fitted kitchen area). The house has underfloor heating throughout, mains water and electricity, internet and satellite TV and a land line telephone. Velux style ceiling windows provide natural brightness throughout. To the exterior there is a beautiful vine covered terrace area, a lovely preserved threshing circle, private garden areas, and a separate detached garage block that comprises a garage, a large workshop/studio and a substantial storage room. The land is irrigated via its own large water storage deposit and a comprehensive irrigation system which irrigates the olive and almond trees. This very substantial property would be ideal as a lovely family home or could be the source of a considerable rental income. The house has potential to be used as one large family house or easily separated into the main house plus a self-contained apartment which provides a perfect rental opportunity or ideal for B&B purposes or merely as a lovely guest annex. This is a fairly unique property and viewing is highly recommended. It is offered at an extremely competitive price. 25 minutes from the coastal beaches.